For a period of a couple years in the mid-1960s when Artforum was based in Los Angeles the magazine’s offices were in the same building where Ed Ruscha had his studio. Ruscha, who had trained as a commercial artist, occasionally worked for the magazine doing layout and design (he would appear under the name “Eddie Russia” on the masthead of a few issues). In the early years Artforum was perpetually on the edge of financial insolvency so in the March, 1964 issue Ruscha took advertising space in lieu of payment and used it to promote the first of his celebrated artists’ books, Twentysix Gasoline Stations, which he had published a few months earlier. The ad offers the book for $3 a copy. 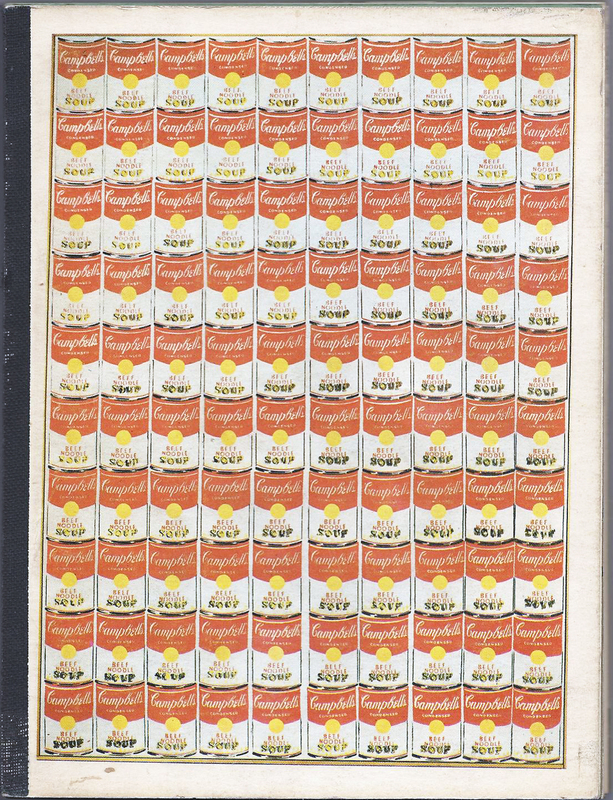 Upon publication Ruscha had sent a copy for inclusion in the Library of Congress’s collection, but the librarian who reviewed the submission, apparently nonplussed, declined to accept it and the book was returned. Ruscha, who has said that he wants his art to elicit a response of "Huh? Wow! ", was delighted at this reaction and so his ad touts the book's "REJECTED" status as a primary selling point. levy, d.a. The Madison Poems of d.a. levy. Including Collages, Concrete Poems, a Bibliography, an Essay, and The Suburban Monastery Death Poem. Madison, WI: Quixote Press, 1969. 4to. ; mimeograph printed on variously colored leafs; illustrated wrappers; stapled; with 22 loose leaves of varying size and color printed with b+w reproductions of levy’s collages; held in screen-printed envelope. Minor wear at edges of envelope else fine. The work contained in this posthumously published packet is perhaps the crowning achievement of d.a. levy’s brief but prolific career. It was created over the course of about one month in the Fall of 1968 when d.a. levy briefly left Cleveland, the city with which he was closely identified throughout his life, and went to Madison, Wisconsin where two professors at University of Wisconsin, Dave Wagner and Morris Edelson, had recently made up a position, “Free University Poet-in-Residence,” and asked d.a. to be it. In the years from 1963 to 1968, d.a. 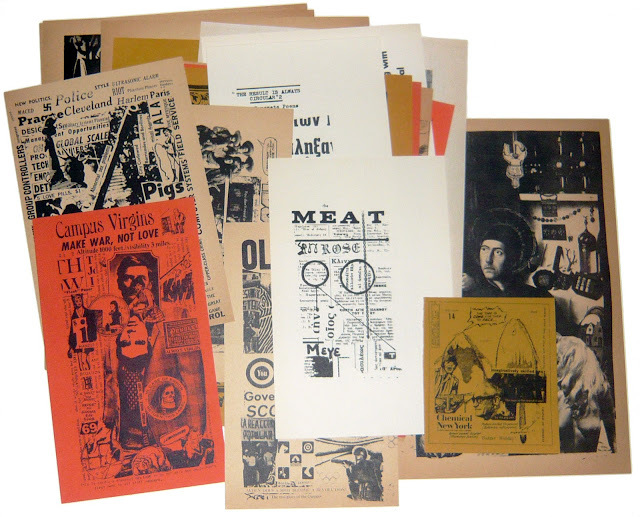 levy produced numerous handmade publications that helped to define the small press resurgence in America. Influenced perhaps as much by the European Surrealists as by the Beats, levy was a dynamic personality and produced work prolifically. The scores of small books and magazines he produced using a rudimentary hand press (and later, a donated mimeograph) were a major influence on the underground press movement, producing scores. The bulk of this production was given away on the streets; levy saw it as his mission to bring cultural enlightenment to the city of Cleveland. To that end, he established the Renegade Press (later called Seven Flowers Press), "printing sometimes 8 to 16 hours a day for days and days." In addition to his own work, levy printed works by Charles Bukowski, Ed Sanders and others; he also produced small pirated editions of classic texts which had influenced him, including works by Rimbaud, Camus, W. Y. Evans-Wentz, Artaud, and others. In 1966 levy found notoriety in Cleveland after making a series of public statements in favor of marijuana legalization and against the war in Vietnam. That Autumn, he was indicted by a secretly convened Grand Jury for distributing obscene materials. In January 1967, the indictment was made public and levy was arrested, and subsequently released on bail, along with friend and patron James Lowell, owner of an alternative bookstore which carried levy's work. In April, 1967, levy was arrested again, allegedly for giving copies of his poems to two teenagers at a coffeehouse reading. Subsequently, a defense fund was organized; donations poured in from poets across the country, and there were "Free levy" demonstrations in the streets of Cleveland. Allen Ginsberg and The Fugs came to Cleveland and gave a benefit reading. Ultimately, the charges against levy and Lowell were dismissed, but the experience left an indelible mark on levy who became increasingly bitter, disillusioned and depressed. Nonetheless, levy continued his prolific output, experimenting with Concrete Poetry and collage in order to push beyond words toward a more expressive language. Ingrid Swanberg, a friend of levy's who edited a collection of levy's works (Zen Concrete & etc. ghost pony press, Madison, Wisconsin, 1991), wrote that "levy reduced the word to silence. He broke-up, cut-up, shattered, fragmented, pulverized the word in concrete poems, his silence erupting against the death carried by the word and the death carried by the image, as if to throw everything think-able into disruption ..."
By mid-1968, levy had published over 55 books and nearly 30 magazine issues. In October he went to Madison and produced the Madison Poems and Madison Collages and then returned to Cleveland, where his legal and financial troubles continued. Friends found his behavior increasingly erratic and disturbing. He sat in his apartment, holding a rifle, and asked "How symbolic would it be if I blew my brains out?" He burned manuscripts of all his poetry, 300 copies of Tibetan Stroboscope (a collection of concrete poetry), and several original collages, gave away most of his belongings, quarreled with his wife and threw her out, visited friends he hadn't seen in years "to shake hands one last time", and told people he was "leaving Cleveland. I'm leaving the world." Then on November 24, 1968, at about 11:30 pm, levy sat alone in his apartment, put a .22 caliber rifle between his eyes, and pulled the trigger. He was 26. 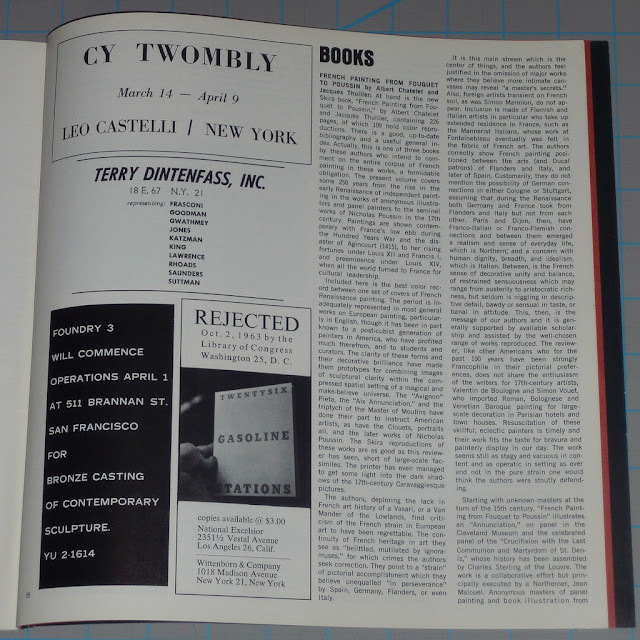 This publication was assembled between January and March of 1969 by Edelson and Wagner who knew levy’s work intimately and saw the Madison Poems and Madison Collages first hand as they were produced and this publication is in keeping with the spirit and methodology of levy’s own productions. enigma boring book. Ernie Stomach. New York: Genesis : Grasp Press, 1971. Oblong 12mo. 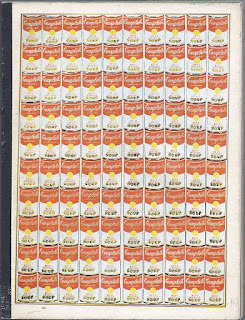 ; illustrated throughout with black line drawings; printed wrappers; stapled. Very good. First edition; one of 470 copies. Signed, “by authority of Richard Meyers, Nov. 2009.” One would not immediately link this odd publication to the birth of punk but look again. 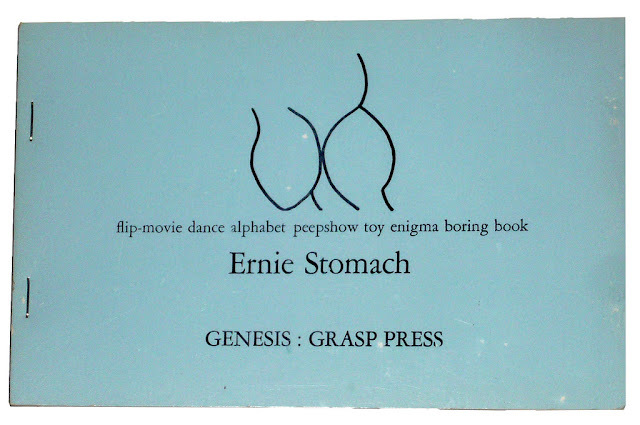 Uh is perversely inarticulate poetry, an almost indecipherable alphabet book composed of vaguely stomach-like, or possibly sexually suggestive, letter forms. It was published by poet Richard Meyers, who would soon gain fame and notoriety as Richard Hell. Hell was the lyricist, vocalist, and bass guitarist of Television, the band he and Tom Verlaine formed in 1974. His music, attitude and fashion sensibility were immensely influential in defining the sound and look of punk in the early to mid-70s. Later he formed Richard Hell and the Voidoids and in 1977 recorded Blank Generation, probably the outstanding achievement of his career and one of the truly iconic albums of the punk era. 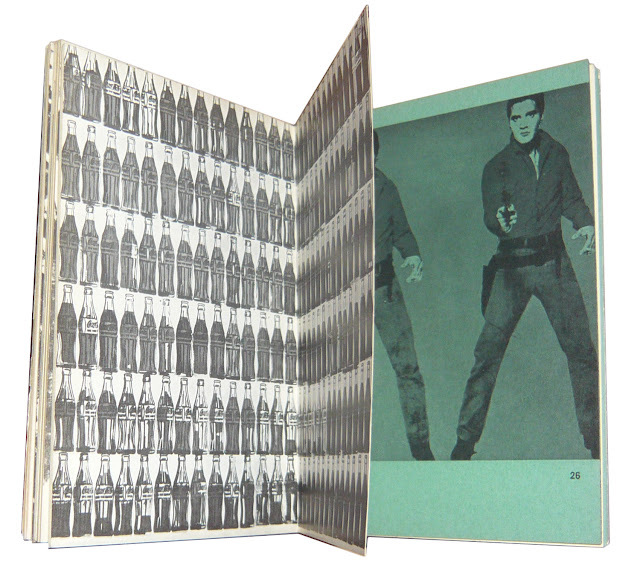 Something of his iconoclastic aesthetic sensibility can be seen in this, his first book.